Other Professional Experience: Vocational Specialist for Special Needs students 2001 - 2002 CHSD218/Moraine Valley Community College Co-op: "MOST" program. I grew up in the south suburbs of Chicago, Illinois. I earned a basketball scholarship to Saint Xavier University in 1992. I earned my bachelor of science degree in biology in 1996. I worked as a rehabilitation specialist in a chiropractic clinic for several years after college. I later went back to Saint Xavier to earn my teaching certificate (2002) and complete my Masters in Secondary Education (2006). I was hired to teach science at my old high school which I had attended as a student years earlier, Alan B. Shepard High School in Palos Heights, IL. I taught science and coached baseball at Shepard High School from 2003 to 2009. My family and I moved to Apison TN for a brief time in 2009, where I gained experience teaching middle school at Normal Park Museum Magnet School for two years. We temporarily returned to Chicago for the years 2011 and 2012 only to return once again to Apison TN for good! We have built a house here and we are excited to finally be where we belong. I began teaching here at Heritage High School in the fall of 2013 and I am looking forward to my second year here at Heritage. 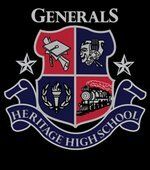 Heritage is a special place and I am excited and honored to be a "GENERAL!" *Below are a few professional endeavors I'm proud to have been a part of during my teaching career.